The proposed Muskuuchii hills biodiversity reserve is located in the Nord-du-Québec administrative region, between 50°04’ and 50°27’ north latitude and 78°22’ and 78°58’ west longitude. 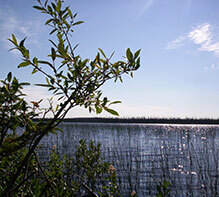 It is situated 90 km north-north-west of Ville de Matagami and 105 km south of the Cree village of Waskaganish. With the enlargement, the proposed biodiversity reserve covers an area of 801.1 km². It lies within the territory of Municipalité de Baie-James.